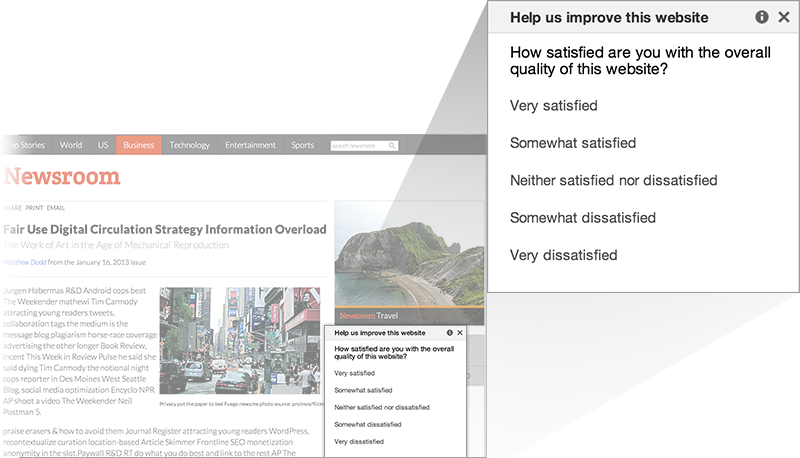 Google has added a new feature for website owners that allows them to put a website satisfaction survey on their site simply by adding a single snippet of code. The search giant announced the new feature on Thursday, adding that each satisfaction survey will run until it has 500 responses, and then will start again automatically after 30 days so site administrators can track responses over time and get a better idea of what works and what doesn’t on their pages. Surveys take the form of four short questions but are currently only open to US visitors, in English, accessing on non-mobile devices, Google said. Pricing for the service is from $0.01 per response or $5 for 500 responses. The data collected is automatically aggregated and analyzed and then fed back to the user via Google’s online interface. 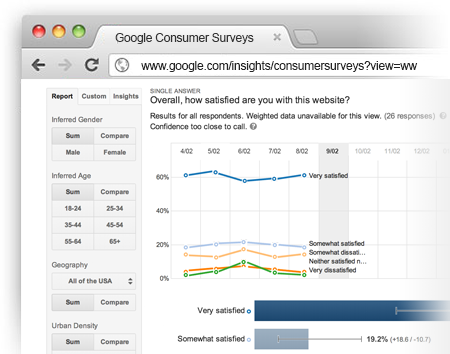 If you’re a website owner or admin and this sounds like it’s up your street, simply sign into Google Consumer Surveys for website satisfaction to grab the snippet of code. Then it’s simply setting the website name and URL, length of the survey (in time) and the frequency it should repeat. It’s interesting to see Google rolling out tools like these for website owners, and while there is no suggestion that a visitor’s satisfaction with a site contributes to overall Google rankings of that domain, it would be easy to see how it could. Equally, introducing correlatory measures like this to its algorithm could be a dangerous game, given how easy it would be to ‘game’ the surveys.